The R&S®THR9 high-power FM transmitter family makes terrestrial broadcasting of audio broadcast signals extremely efficient and also saves space. The R&S®THR9 contains open source software packages. Copies of the respective licenses are included in the Open Source Acknowledgement, see Downloads/Software area of this web page. 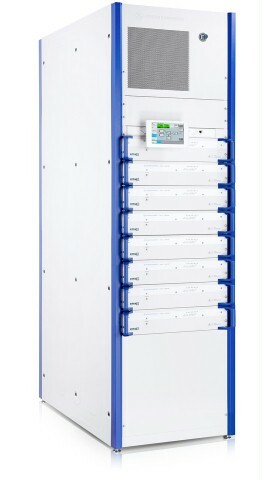 The liquid-cooled transmitters deliver FM output power of up to 40 kW per rack and up to 80 kW in two racks. The integration versatility ranges from single transmitters with built-in pump unit and space for additional system components to multitransmitter systems and even N+1 configurations in a single rack. 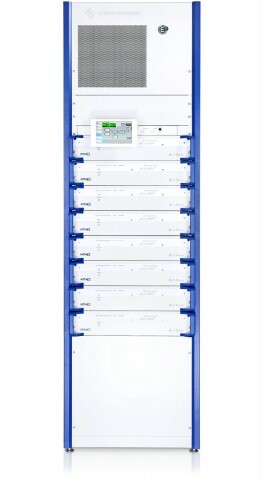 By making it possible to integrate high output powers as well as multiple transmitters, Rohde & Schwarz offers the highest power density per rack. 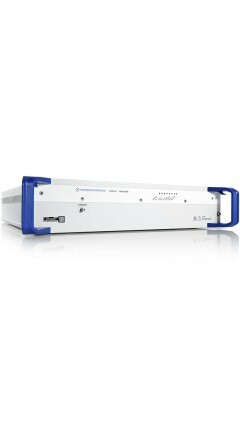 The R&S®THR9 transmitter family for band II attains efficiency values of up to 75 % in analog FM mode. Unlike air-cooled FM transmitters, the R&S®THR9 incorporates a completely redundant and highly efficient transmitter cooling infrastructure. As a result, the cooling infrastructure and the transmitters are perfectly matched, which offers major advantages in 24/7 operation. The R&S®THR9 highpower transmitter family supports the hybrid HD Radio™ standard (IBOC) as well as purely digital standards in band II. 1) With built-in AC overvoltage protection; more stringent requirements must be satisfied by implementing appropriate measures at the transmitter site.